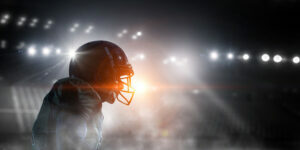 Football season is back, and you might have noticed some of your favorite players have been benched due to a variety of injuries or health issues on the field. Unfortunately, these injuries can also affect high school and college football players, too, not just the pros. Here are some of the top common football injuries you may experience or witness this football season. Ankle sprains are common throughout the world of sports. When athletes are running over variable terrain, any number of things could happen when a quick change in direction is necessary or there’s contact between players. An ankle sprain can look different from person to person but it typically involves swelling, pain, and difficulty supporting the person’s weight. Continuing to play on a mild sprain could slow down the healing process or worsen the injury. Every day, around 25,000 Americans suffer the pain of an ankle sprain. If a football player has played for a long time, they’re more susceptible to overused muscles and tendon damage. Tendonitis is an injury that causes pain, tenderness, and inflammation in the Achilles tendon. If it isn’t treated properly, it can even lead to degeneration of the tendon. Tendonitis can be acute, chronic, or long-term depending on the severity of the injury. If you think you have tendonitis, visit your local walk in clinics for the proper treatment. The greatest risk of playing football is suffering a concussion. This injury occurs when blunt force causes trauma to the brain. It can lead to headaches, memory lapses, problems with balance and coordination, and long-term damage to the brain. This is a popular injury associated with playing football due to the physical nature of the sport. Tackling is a key aspect of playing and countless athletes knock helmets or hit the ground a little too hard. In the event a player is confused or shows a lapse in judgment or coordination, get them to an urgent care center quickly for diagnosis and recommended treatment. Football is one of the most popular fall sports in America. As such, it’s important to locate your nearest urgent care centers for kids in case an injury should occur while playing. For the best urgent care Houston has to offer, visit Convenient Urgent Care today to treat your seasonal injuries.